During last weekend’s Star Wars: Galactic Nights event Disney gave guests a sneak peek at the new Star Wars: Galaxy’s Edge land coming to Disney’s Hollywood Studios. In the new land guests will have a chance to actually climb on board the Millennium Falcon and walk through the hallways and sit in the cockpit. Disney also announced that they are building a fleet of X-wing fighters for the new land. 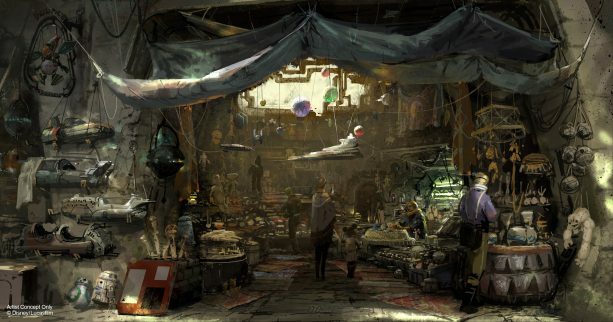 Star Wars: Galaxy’s Edge will be a new land in the Star Wars universe – one that fans have not seen on screen in the film saga. Fans also had a chance to see artist renderings of the new land including the toy stall – one of the marketplaces in the new land. The toy stall will sell items from the Star Wars galaxy in addition to items that are hand-crafted by local artisans. Star Wars: Galaxy’s Edge is set to open in 2019.